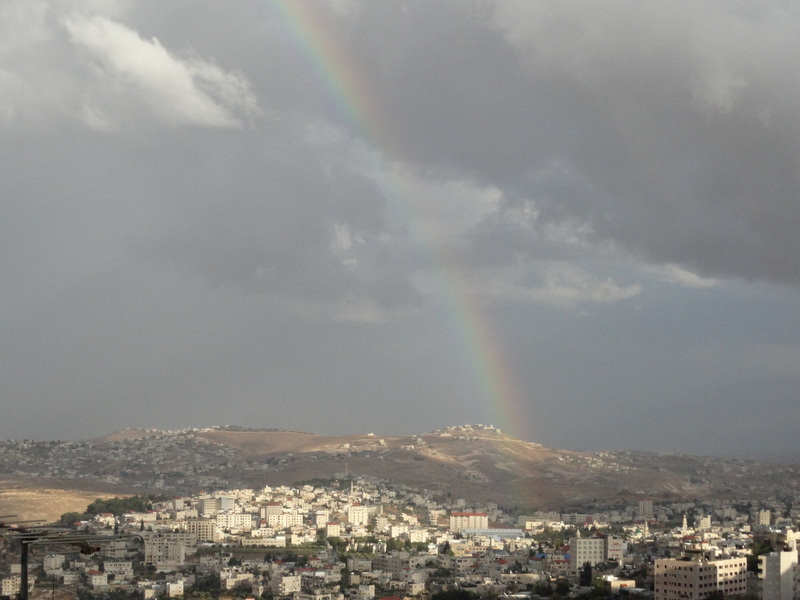 While I was in Jerusalem less than three weeks ago, a rainbow arched across the sky and spilled onto the land irregardless of international law, race, history, or religion. I thought of Genesis 9 and the fact that the rainbow has long been a sign of God’s promise for every living creature, all humankind and the animal world. Never again shall such destruction ravage the earth. I thought of the fact that the bow is a traditional weapon of war, but here it is transformed as a symbol of peace, God’s unconditional commitment with all living creatures, that massive destruction will not have the last word…ever again. Massive destruction still occurs. The weapons of war have not been transformed. Sometimes it makes one wonder if God has forgotten the promise. Or is it we who have forgotten the promise? Is it we who fail to transform weapons of war into instruments of peace? Perhaps God is always at work creating a human rainbow, a people empowered by God’s Spirit who work for the greater good, who know something about unconditional love and who cast their glow on the hurting places in the world, insisting that massive destruction does not have the last word. Today I find myself wishing for a Rainbow to shine on the city of Ferguson and beyond. One can’t simply pray a rainbow into existence, but one can pray for the human rainbow that stretches from city to city, land to land. One can pray and act in solidarity with those who rise up and challenge acts of destruction and brutality, and who refuse to let these things have the last word. “I raise my hands in surrender.” When life’s too much and fear crouches before me, claws at the ready to shred my confidence… I raise my hands to God. Today, I raise my hands not to worship but to pray for the community of Ferguson and the families of Mike Brown, Eric Gardner, and John Crawford. I raise my hands to God who out of his great love for his children heard their cries and carved a path towards justice when there seemed to be no way. Make a way in Ferguson, MO, Lord. Make a way and drown the Enemy of your peace in your waves of Justice. Today, I raise my hands because the truth is Black Lives Matter and black kids don’t have to be college-bound for their deaths to be tragic. I raise my hands for the truth that Jesus identified with the poor, broken, marginalized, and ignored. I raise my hands because Jesus is our Truth and he will make us free. I raise my hands because it is so true that He will empower us to beat our swords into plowshares and our spears into pruning hooks— we need only identify ourselves as willing truth-tellers. So, I lift my hands to receive the necessary tools of this Heavenly alchemy: a humble heart, listening ears, love-spun courage and most of all, open palms that refuse to cling to bitterness, hate, or fear. Today I raise my hands in surrender. I can’t do this work on my own. I can’t even pray for reconciliation on my own—I need to the Holy Spirit to come and take my jumbled, incoherent words and turn them into something powerful. Lord, place a terrible fear in the heart of the Enemy, and advance your Kingdom of Peace where Violence has made it’s camp. I am but one women with a heart for the many who are sweltering in the racially charged climate of our country— nevertheless, I raise my hands. I raise my hands in surrender. I raise my hands in protest. I raise my hands in holy anger. I raise my hands in solidarity with the people of Ferguson, MO. Will you raise your hands, too?